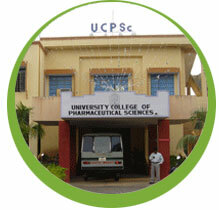 Established in 1974 as department of Pharmacy, it was given the status of a college in 1981 and named University College of Pharmaceutical Sciences. It is recognized as one of the best Pharmacy Colleges in India and enjoys world wide recognition in the field of research. B.Pharm. and M.Pharm courses are offered in the College besides Ph.D programme. It has produced 60 Ph.Ds during the last 12 years and the State Govt. honoured three of the teachers with the Best Teacher Award. vii) novel synthetic drugs of different therapeutic categories. The college has research facilities like UV spectrophotometer, HPLC, GC, refrigerated centrifuge, Zeta meter, lyophilizer, rotary vacuum evaporator, water purification system, horizontal autoclave, inverted microscope, rotary tablet machine, Laminar airflow cabinets, etc. The faculty of the Pharmacy have been sanctioned research projects by various research funding agencies to the tune of Rs. 2.00 crores so far. The college was identified by the UGC under the DRS-SAP programme and sanctioned Rs 46.60 lakh and the DST has sanctioned assistance of RS 32.00 lakhs under the FIST. The college has also developed Electronic Data Access Lab with Internet facility for the benefit of the students and the faculty. The research activity of the department include natural product isolation and characterization, computer aided drug design, synthesis and characterization of new chemical entities for asthma, cancer, depression, etc., preclinical screening of natural and synthetic chemicals, chemoprophylaxis of leprosy, molecular biology of cancer and aging, drug metabolism and pharmacokinetics, development of novel drug delivery systems, liposomes, niosomes, nanoparticles, lipid particles, transdermal drug delivery systems, mucoadhesive drug delivery systems prodrugs, plant tissue culture and medicinal plant biotechnology, mono/polyherbal formulations, etc. The College has been identified as a nodal point for Quality Improvement Program (QIP) by the All India Council for Technical Education and has organized short term courses to upgrade the expertise and capabilities of faculty members of the Pharmacy Institutions in the country.